Round-the-clock monitoring for seepage from the installation. Alarm is reported at a certain time of day, e.g. 10:00 in the morning; seepage checking is optional for any weekday. With dependence on manning, the installation is monitored for constance, mean flow, peak flow and discharge. Alarm is reported when the relevant limit is exceeded. The front of the controller features a key for Alarm Acknowledge/System Restart [START], and a key switch for selecting site manned/unmanned [DUTY ON/OFF]. The controller is equipped with an orange flashing alarm light at the top. 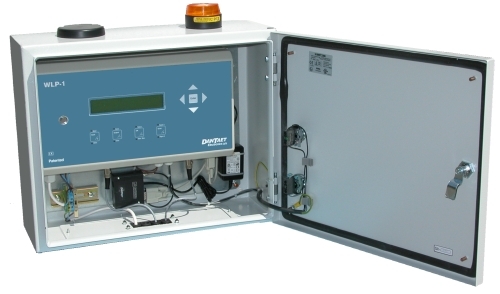 The controller is supplied by 240Vac 50Hz L-N-PE max 50VA in terminals on the enclosure's base plate. Power, meter and valve cables are routed via the rubber gland in the bottom of the enclosure, whereafter this is properly fixed. When correctly assembled, IP65 performance is achieved. Meters and valves for system CSLP can be supplied in all sizes from ¾" to DN100. It is customary to pick the same dimension as the transmission pipe immediately inboard of the meter to avoid meter overload.